The two girls are identified in writing beneath the photo; Lucille Hand and Jerry (Geraldine Lynch Klepser). 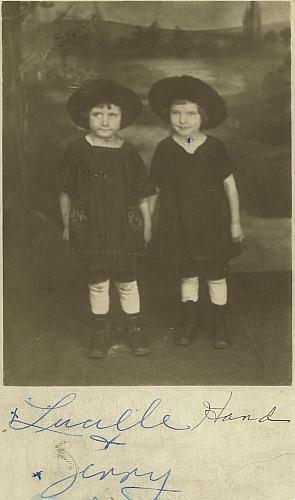 The two are dressed almost identically in short dresses with bloomers beneath, long white stockings, high-top shoes, and hats. Behind them is a painted backdrop which was often used in portrait photography at the time. Title by contributor. Geraldine Lynch Klepser is the great grandmother of Megan Maresco who provided the photo.